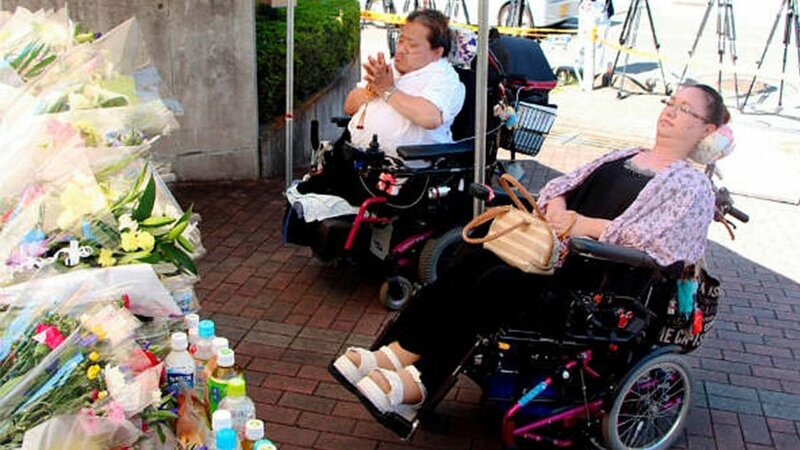 As I write this it is now five days since the Sagamihara Attack, where Satoshi Uematsu stabbed 19 people, and injured 26 others at the Tsukui Yamayuri-en care home for the intellectually disabled in Sagamihara, Kanagawa Prefecture. Thank you very much for reading this letter. I can wipe out a total of 470 disabled individuals. I am fully aware that my remark is eccentric. However, thinking about the tired faces of guardians, the dull eyes of caregivers working at the facility, I am not able to contain myself, and so I decided to take action today for the sake of Japan and the world. My reasoning is that I may be able to revitalize the world economy and I thought it may be possible to prevent World War III. I envision a world where a person with multiple disabilities can be euthanized, with an agreement from the guardians, when it is difficult for the person to carry out household and social activities. I believe there is still no answer about the way of life for individuals with multiple disabilities. The disabled can only create misery. I think now is the time to carry out a revolution and to make the inevitable but tough decision for the sake of all mankind. Let Japan take the first big step. Would Mr. Tadamori Oshima, who bears the world, use his power to make the world proceed in a better direction? I sincerely hope you would deliver this message to Mr. Shinzo Abe. This is the answer I reached after serious thinking about what I can do for humankind. Dear Lower House Speaker Tadamori Oshima, would you lend your power for the sake of dear Japan and all humankind? Please give this full consideration. It will be carried out during the night shift, when staffing is low. The target will be two facilities where many multiply disabled people reside. Staff on guard will be strapped with cable so they can’t move and can’t make contact with anyone outside. The act will be carried out speedily, and definitely without harming the staff. After wiping out the 260 people in two facilities, I will turn myself in. In carrying out the act, I have several requests. After my arrest, my incarceration should be up to two years, and please let me lead a free life afterward. Innocence on grounds of insanity. A new name (Takashi Iguro), government registration and documents such as a driver’s license needed for everyday life. A disguise for regular society through plastic surgery. Financial aid of 500 million yen ($5 million). I would like these conditions to be promised. If you can make your decision, I will carry it out at any time. Please consider this fully for the sake of Japan and world peace. I hope with all my heart that this can be discussed with Prime Minister Shinzo Abe, although I am sorry to trouble him in an unimaginably busy schedule. “Following his discharge, the care home installed more than a dozen security cameras based on police advice. Kanagawa Prefecture oversees the facility. The Gov. Yuji Kuroiwa says his office was left in the dark and none of that information was shared with him. “We believe there have been problems in the way authorities share information. We will cooperate with the authorities concerned so this kind of incident never happens again. We will verify the matter thoroughly in order to develop preventive measures,” he says. The governor said people tend to think the suspect’s discharge was too early. But he said holding him any longer would have created a human rights issue. He said he wants to consult with experts on how to best deal with such a situation. An expert on forensic psychiatry said more information is needed to tell whether proper measures were taken during Uematsu’s stay in the hospital. “It’s hard to say at this point whether this incident was preventable or not. I have to say that there was no problem with him being released from hospital because the doctors saw that he was no longer mentally disturbed at that time,” Igarashi says. But he says the problem is that there’s no proper follow-up system after such people are released. “We’ve experienced many tough times, but we adore our child regardless of whether she has disabilities or not,” said Nobuyuki Noguchi, 76, while looking at a photo of Takako Noguchi, his daughter who is unable to speak. “It must have been especially tough for her since she can’t express her pain in words. I feel like my blood is boiling with anger,” said the father, who says he can understand her thoughts through her facial expressions and behavior. “Atsuko Kubo’s son, Jusuke, is 41 years old. He is not able to speak and lives in a care facility. She says she was deeply hurt by what the murder suspect was saying, that people with disabilities should disappear. Kubo heads an organization of people with intellectual disabilities. It issued a statement on its website saying each and every life is priceless regardless of its challenges. An organizer at one care facility has been trying to create more awareness of and interaction with people with disabilities. Masahiro Tate came up with a plan to open the building up to eliminate social stigma. “We were trying to live together with the community,” he says. And it seemed to be having an effect. More and more local residents were visiting the facility to celebrate festivals with the people who live there. But Tate now has a dilemma. After Tuesday’s stabbing, the prefectural authority urged him to tighten security. He used to close the building’s gate at 10 p.m., but now tries to make sure it’s closed all day. “It’s truly regrettable and a severe situation that we have to limit access to the facility,” Tate says. For Kubo, it’s important to let others know that people with disabilities do have families who care about them. One small example of her love is a scarf she gave Jusuke 10 years ago. He’s worn it ever since. She says she wants everyone to know a family bond is not affected even if there are challenges in communicating. “He is an essential part of our family and brings us all closer together,” Kubo says. Dr. Michael Gillan Peckitt is an academic who lives in Nada-Ku, Kobe, Hyogo Prefecture, Japan. He runs the Japan and disability related website ‘The Limping Philosopher’ (https://thelimpingphilosopher.wordpress.com) and you can find him on Twitter @Peckitt. Check out his ebooks on Amazon.